If your order weighs less than 13 ounces, save huge on shipping with USPS first class (with tracking number). This product weighs 3.5 oz. We have a non-time release version of this product available. 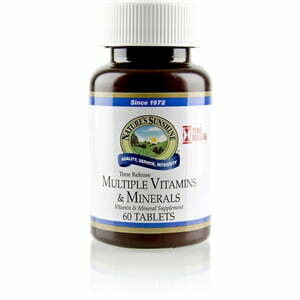 Nature’s Sunshine Multiple Vitamins and Minerals, Time-Release is specially formulated to provide the powerful health benefits of many vitamins and minerals over an extended period of time. Multiple Vitamins and Minerals, Time-Release contains 100 percent daily value of 16 key vitamins and minerals along with varying amounts of several other essential nutrients. The formula contains no sugar, starch, artificial colorings or flavorings. Instructions: Take one tablet daily with a meal. Cellulose (plant fiber), stearic acid, magnesium stearate, silicon dioxide (powdered silica), Yucca root (Yucca baccata), para-amino benzoic acid (PABA), choline (bitartrate), inositol, lemon bioflavonoids, rutin, hesperidin, Alfalfa herb (Medicago sativa), Kelp plant (Ascophyllum nodosum and Laminaria digitata), Chamomile flowers (Matricaria recutita), Dandelion root (Taraxacum officinale),Rose Hips fruit and extract (Rosa canina), Myrrh gum (Commiphora molmol), Golden Seal root (Hydrastis canadensis), and Wheat germ.